Happy New Year everyone! Matt and I are really looking forward to 2014. To get ready for the coming year we have cleaned off our erasable marker calendar and filled it with new dates and goals for Thread Theory. I've cleaned out my sewing studio as well so it is ready for new projects. I even went fabric shopping with my mom to re-fill my cleaned and surprisingly empty fabric closet. Fabricland notified us both of their annual New Year sale which takes place on January 1st and consists of the whole store being AT LEAST 50% OFF!!!! As soon as we were notified we started carefully laying out our plans. Fabric shopping with my mom is no laughing matter, indeed it is a carefully planned tactical operation designed to yield maximum results - complete with a Dec. 30th reconnaissance mission and a stream-lined 30 minute raid of the fabric store right as the doors opened at 10am. Our motive was to get in and get out before the crowds so as to have enough time and energy to still enjoy our holiday away from frenzied shopping madness. We were very successful and the Fabricland employees had a laugh at our organization level. My mom was in charge of the master cutting list and was the first to the cutting table despite the store being absolutely packed with shoppers. We piled the table high with our fabrics and I headed off with our notions list. Despite the huge amount of fabric we were buying, we somehow also made it to the checkout first! The line up quickly grew behind us but my mom clicked open her trunk from the till and we were out the door with enough time to spare in our 30 minute slot to carefully check over our receipts. Our careful planning led to a total of zero impulse purchases, a great pile of co-coordinating fabrics ready for pattern samples throughout the next year, and one treat for myself in the form of super bright and summery kimono fabric for a summer dress! Mission accomplished! She is intimidated by nothing and with one project under her belt went right on to drafting a full lining and perfectly matching the plaid - two projects that would instil fear in many sewer's hearts I am sure! Her jacket turned out really well but unfortunately didn't quite fit it's recipient. I guess that is one of the dangers of guessing someone's measurements and not being able to try on the garment during the sewing process. I hope, with a small adjustment or two such as shortening the sleeves, the cardigan might nicely fit Sue herself! In order to make the knit cardigan pattern work with a woven fabric (with absolutely no stretch) Sue chose a size larger than the recipient would likely need (she guessed he was between sizes). 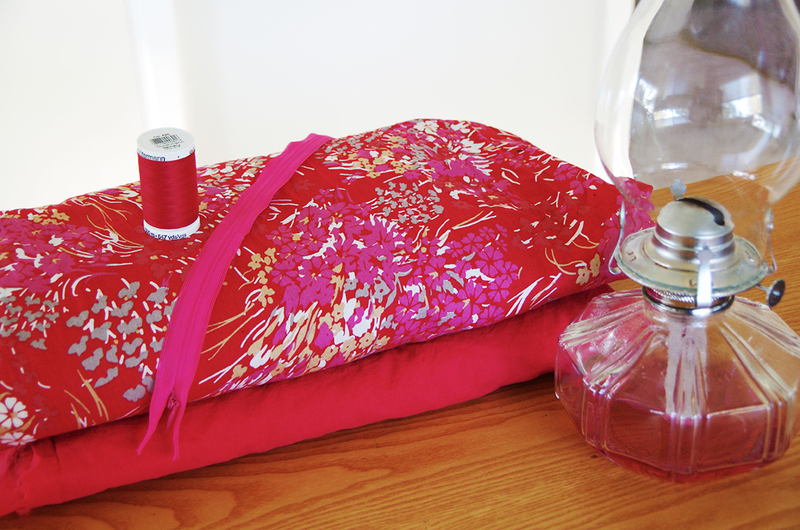 She also used smaller seam allowances in some areas to provide a little extra room in the shoulders and the waist. 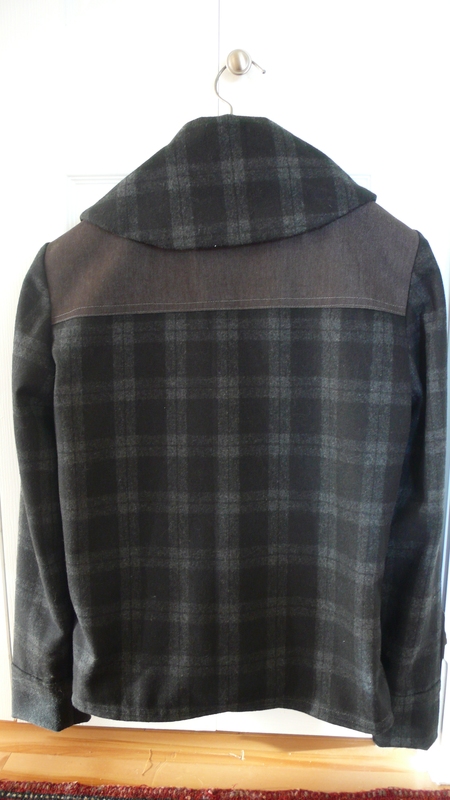 I think she did an excellent job and that the Newcastle makes a very cozy and elegant plaid wool jacket! If you want to try sewing the Newcastle with a woven I would highly recommend making a woven mock-up first as the pattern is designed for stretch fabrics and is quite close fitting in areas such as the shoulders, the biceps and the waist/trunk. Seeing how nice Sue's looks really makes me want to give it a try! I Love your mother in law´s version. I have some lovely flannel to go with this pattern and I think I will have arty! Hehe, I wish I could go fabric shopping with your Mom. Sounds like great fun as well as being super productive. I love that print you bought for yourself. What a nice splurge! Your Mother in law is doing a great job! Sometimes not knowing what you’re jumping into allows freedom and you get amazing results because you’re not hindered by fear. Just like her. She is, isn’t she! I will let her know (though I bet she is reading these comments so will see your compliment before I have passed it along :) ). We don’t have any plans for a re-release of the pattern but my advice for attempting it with a woven is to go up a size and then experiment with some cheap fabric to see where you need to remove some width or add width (as this is the main concern when adapting a pattern designed for knits). You will be surprised how easy it is if you just jump in! You shouldn’t need a revised version of the pattern as the construction method included in the instructions will work well for both knits and wovens while the pattern itself is mostly lacking in the ease and width required for wovens which would be accommodated for by going up a size. Give it a quick try! I hope it works out for you! Morgan, I wish I was even half as organized as you. I had all the best intentions of buying a knit fabric for the Newcastle Cardigan, but nothing struck my fancy until I saw the wool/poly woven, and I couldn’t put it down. I loved the feel and the weight of it, and imagined how warm and cozy it would be. It wasn’t until I got it home and started laying it out that I really realized what a crazy thing I had done buying a woven and a patterned one at that for a stretch cardigan. I think EmSewCrazy got it right…no fear when you don’t know what you’re jumping into (or rather just being impulsive). Anyways, I’m not too disheartened that it didn’t fit the recipient because I think it will be fairly easy to adjust to fit me, and I do love it! Next time I go shopping for fabric for a gift garment (which will be soon as I still have a gift to make) I’ll stick to the pattern recommendations. And now that I’ve sewn the cardigan once I think I’ll have more confidence handling a knit fabric. All good learning! Wow you and your mom are so organized. Love the fabrics you got. Most of us would be just doing a mad dash grabbing all sorts of uncoordinated fabrics in random yardage. Tell Sue the jacket looks great. She’s amazingly fearless. I missed their sale this year. :( Sounds like you both have a real system going though! That Newcastle is so awesome. Such a pity it doesn’t fit. And you fabric shopping spree sounds so much fun. I bet your summer dress is going to be stunning!